Master Thatcher – Paul Reading recently completed his training to become an approved contractor for the application of Thatchsayf fire retardant. The training took place on a property in Northamptonshire, which was recently thatched by Paul. The 260m² roof was treated with clear Thatchsayf. 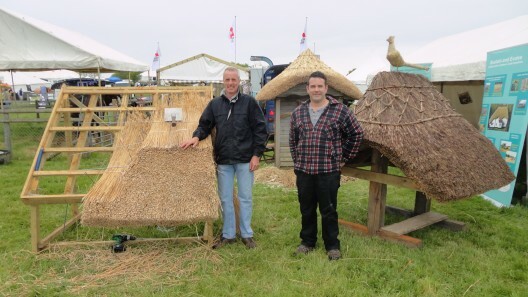 Thatching Advisory Services visited the Devon County Show on Thursday 18th May, despite the weather not being at its best, there were the usual large crowds enjoying the vast array of livestock, agriculture, services and products available. TAS dropped in on The Devon and Cornwall Master Thatchers Association. On their stand that day Mike Dray, Jason Rose and Lee Hawkins were happy to share their knowledge and experiences with the people that visited their stand. Lee was busy demonstrating the construction of a pheasant which would be attached to the ridge of a property on completion as a final flourish. 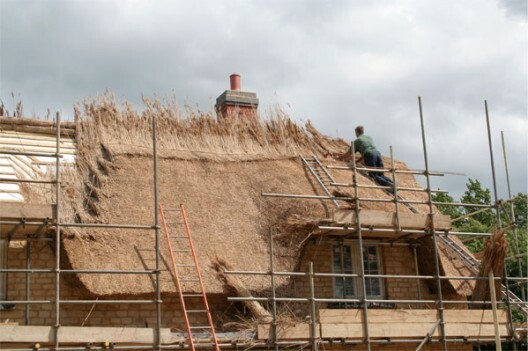 The Association, founded after the last war, are dedicated to maintaining the high standards of workmanship and caring about thatched houses and their owners.